A clogged or smelly drain happens to everyone. At some point in time, the bathroom or kitchen drain clogs and dirty, contaminated water backs up, and an unpleasant odor is unleashed. While lye-based drain cleaners are typically recommended in these situations, these kinds of products are extremely toxic and can damage not only the pipes in your home but your lungs as well. Instead of reaching for that bottle of toxic drain cleaner, try these organic natural drain cleaner recipes that are easy to make and safe for your family and the environment. The next time your drain becomes clogged, you don’t have to shell out a ton of cash for a caustic, potentially hazardous commercial drain cleaner. Instead, look through your kitchen cabinets for a few essential ingredients and mix up your DIY drain cleaner that’s guaranteed to tackle even the toughest drain build-up. A grease build-up, hair clog, or food waste that is thrown into the garbage disposal can quickly clog your pipes and drains. While there are several commercial drain cleaning products on the market, they can be expensive and contain toxic chemicals that can harm your family, as well as the environment. Here are five natural drain cleaner recipes that will successfully remove any clogs and are inexpensive to make. Baking soda is a base and is extremely useful to unclog a drain when combined with vinegar. Vinegar helps to cancel the nasty odors that are caused by junk build-up, while the organic baking soda acts as a powerful antibacterial substance and disinfectant. It is one reason why baking soda is one of the best natural cleaning products. When the two ingredients are combined, they create a chemical reaction to generate oxygen and carbon monoxide, which works to break up and displace the clog. Pour the baking soda down the drain. Allow it to settle. Pour the white vinegar into the pipe, and plug it with a towel, plate, or drain plug to contain the chemical reaction inside the drain. Allow working for 30 minutes. Remove the drain cover or cap and use hot water to rinse. You may need to repeat this process if you have an especially stubborn clog. A potent solvent and strong anti-bacterial agent, baking soda makes a great non-toxic drain cleaner and toilet pipe cleaner. You can clean sink drain naturally with this non-corrosive homemade, drain cleaning solution that is cheap and safe to use. It can be used on all types of pipes and drains, including the garbage disposal. Remove the drain trap and wipe away the visible remnants around the drain with a paper towel. Replace the drain trap. Combine the baking soda, cream of tartar, and salt. Add some water to create a creamy liquid. Pour the cleaning solution down the pipes and allow to sit for 20 minutes. Pour the boiling water down the drain. Let the mixture stand for about an hour, then rinse with warm water. If you hear fizzing, it’s a sign that the cleaning solution is dissolving the junk deposits that are lining your pipes and drain. Repeat the process as necessary until the clog is eliminated. This homemade drain cleaner uses the power of citrus to unclog your pipes. Using citrus peels and a citrus-infused vinegar, you can quickly unclog pipes without using toxic chemicals. This all-natural cleaner is an excellent alternative to the commercial cleaners and will leave your pipes smelling divine. Place the citrus peels in the mason jar and pour the vinegar in. Place the lid on the jar and allow to sit for two weeks. After two weeks, the cleaning solution will be ready to use. Pour the baking soda down the drain. Immediately pour the citrus infused vinegar down the drain. Cover the drain with the drain plug to keep the fizzing cleaner contained. Allow the cleaner to work for 30 minutes, then pour the boiling water down the drain. Baking soda is a popular, all-natural cleaner that can effectively unclog the pipes and drains in your home. The benefits of using lemon juice to clean drains are less known. However, because lemon juice is highly acidic, it works even better than vinegar to unclog the drains. 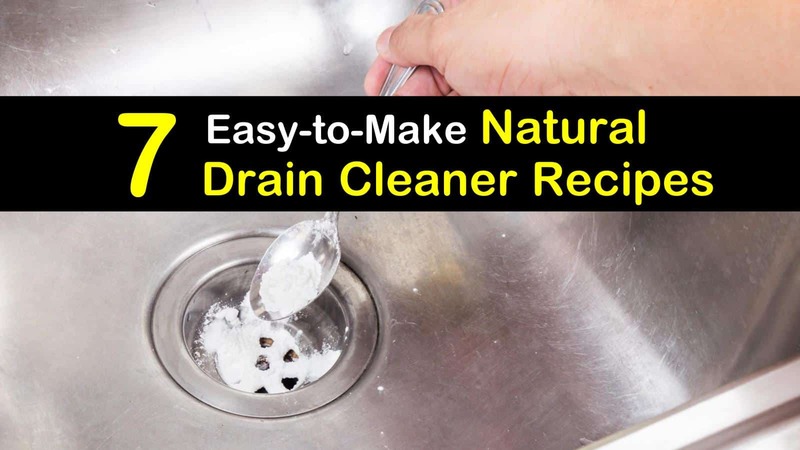 While this recipe will be slightly more expensive, the cleaning powers of this homemade drain cleaner are enhanced and will leave your pipes and drain smelling fresh. Pour the cup of baking soda into the drain and allow it to settle in the pipe. Pour the lemon juice down the drain and cover with the drain plug. Allow sitting for 30 minutes. Then rinse the drain with hot water, allowing to run for about two minutes. Ammonia is another powerful cleaning compound that is used in numerous homemade cleaning solutions like our natural floor cleaning recipe and has been proven to be an effective drain cleaner. Don’t let the pungent smell dissuade you from using ammonia to unclog your drains because it is one of the best non-toxic, all-natural drain cleaners you can use. Pour the ammonia into the boiling water. Pour the drain cleaning solution down the drain and allow it to stand for about 30 minutes. Use a plunger to loosen any clogs that may still be in the pipes. After 30 minutes, pour a pot of boiling water down the drain to rinse everything off. This natural ammonia drain cleaner recipe is based on our how to unclog a kitchen sink with ammonia info. This homemade cleaner for your drains won’t just smell clean and fresh, but it will also remove all the stains, surface dirt, and hard water spots that line the drains, toilets, bathtubs, sinks, and showers in your home. Other essential oils like tea tree or eucalyptus oil are often used as DIY shower cleaner or natural bathroom cleaner. It may not work as well to remove fat deposits and clogs because it doesn’t contain the necessary acid component that is found in vinegar, but it will work wonders for tubs and sinks that take longer to drain. Combine the ingredients in a bowl and pour down the drain. Allow to stand for 30 minutes, then rinse the drain with hot water. Salt is a mild corrosive and an antibacterial product that can efficiently clean all the drains in your home, while the acid in the vinegar breaks down clogs. Borax is a well-known staple for its cleaning properties that has been used in households around the world for ages. In a large bowl, combine the salt and the borax. Slowly add the vinegar to the dry ingredients to prevent the chemical reaction from over-spilling the bowl. When the reaction has started to settle, pour the cleaning solution down the drain and let it stand for 30 minutes. Rinse hot water down the drain. When the drains in your home get clogged, you can use any of these powerful homemade drain cleaners to fix your clogged pipes. These seven recipes are easy to use and won’t cost you a fortune, and because they use natural ingredients, they are safe for both your family and the environment. You can use any of these drain cleaners on a regular basis to remove grease build-up, food debris, and hair clogs and avoid clogged drains from the start. 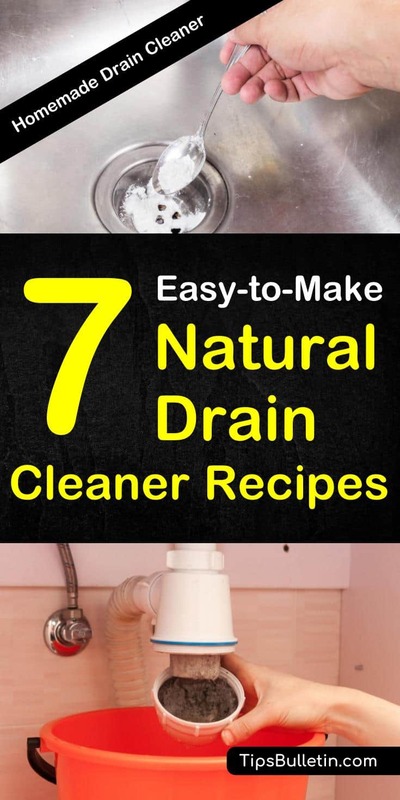 We hope you enjoyed learning how to make these all-natural drain cleaner recipes. If you found this information helpful, please share this article with your family and friends.